Our villa can comfortably accommodate up to 10 people as it has 5 bedrooms and 5 bathrooms, is on 2 levels for a total of 500 square meters. The villa has a 60 square meter pergola with a nice wooden table and a lounge for relaxation, so in summer you can stay in the shade enjoying spectacular views. The villa is located in a reserve where you can see wild animals such as foxes, roe deer, wild boars, hares, squirrels, porcupines, badgers ….. and also from the farmhouse leave numerous walks that lead to waterfalls, ponds, ancient, farms wineries …. These are just 10 of the main reasons why you should choose to rent our villa. 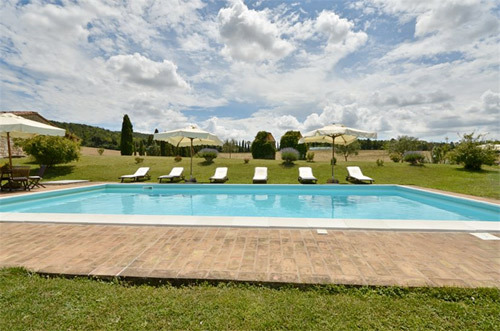 Villa in Tuscany with private enclosed pool of 12 meters for 6, rent for unforgettable holidays. The pool of this rented villa is disinfected with the salt electrolysis process, so it is not necessary to use chemicals. The pool is cleaned every morning and chlorine and ph are constantly monitored. The depth of this pool ranges from 120 cm to 220 cm. 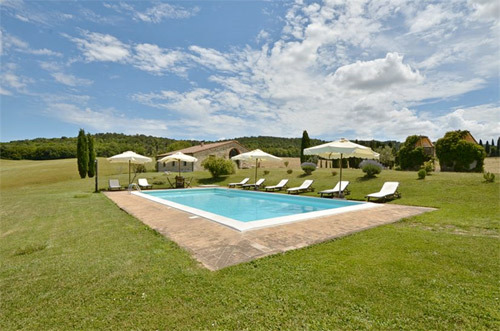 This pool is just meters from the Tuscany villa and is furnished with loungers, chairs and a teak table. 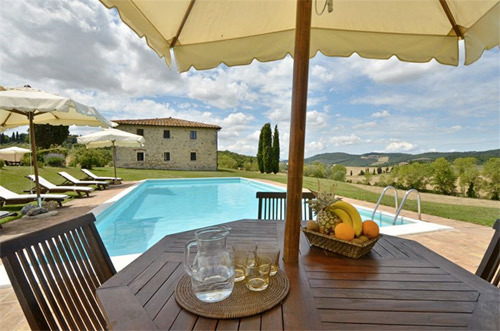 The usefulness to rent a Tuscan villa with a pool especially in summer is to be able to have a nice refreshing bath after spending a day exploring the various villages in the area. Paola and Valerio are always at your disposal for any further information and to provide you a quote without obligation. 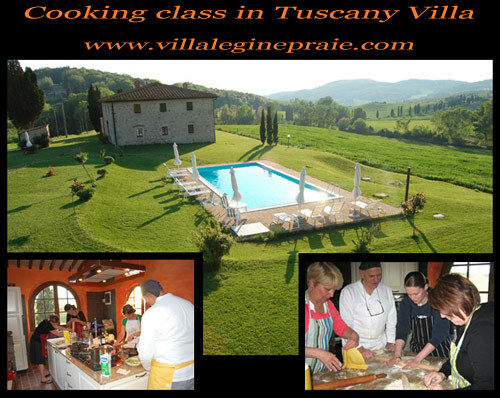 Our villa in Tuscany with pool arranges cooking classes for the guests who rent the whole house. During your holidays in Italy you can spend an afternoon to learn the secrets and tricks of Tuscan and Italian cuisine, our chefs will teach you the ancient local recipes or dishes now almost forgotten. The course lasts about 3-4 hours starts at around 15.30 to 16.00 you will be served a small snack and drink with the inevitable Vernaccia di San Gimignano, which is the typical wine of our region. The cook at the time of booking will offer the menu according to your special requests and allergies. Because the cooking class as we know it is a dynamic course, all participants will have the opportunity to try out the dishes that the chef will propose. Will be the inevitable home-made pasta and ingredients will vary depending on the season. At the end of the lesson you will have designed a full dinner which will include: appetizer, first course, main course and sweet ..
After preparing the dinner, you can go to cool off to prepare for dinner to be held in our “Tavern” or if the temperature permits, on our terrace. Comfortably seated you will then be served the dishes you have prepared in the afternoon accompanied by a good red Tuscan wine of this area. The cooking classes are open to all, we organize courses for incentive travel, holidays or groups of friends who want to spend an afternoon together, learning the secrets of Italian and Tuscan cuisine. This villa is arranged on 2 levels with a total of 400 square meters and can comfortably accommodate 10 people. This house has 5 large bedrooms, 5 bathrooms, a kitchen on the ground floor overlooking two large tables: The first table is located under the veranda and is a perfect place to eat or stay together in the days of bad weather, the second is located on the rooftop terrace with a fabulous view of the sunset. On the first floor there are two bedrooms with 5 bathrooms, 2 living rooms and 2 kitchens. 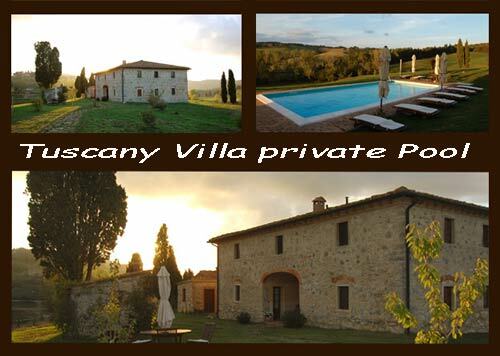 This villa in Tuscany, it is suitable for two or three families who want to spend their holidays together, but at the same time wish to maintain their privacy and their own space. The ground floor and the first floor are connected by an ancient stone staircase inside. 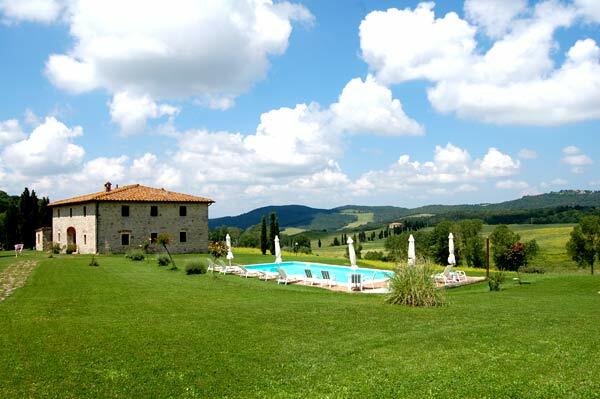 The garden of this Tuscany villa with private pool covers half an acre and has a house used as a laundry for guests, an old stone oven that guests can use to try to bake bread and homemade pizzas. Close to the villa for rent there is another small house converted into a restaurant that is open only on request of the guests staying at the villa. 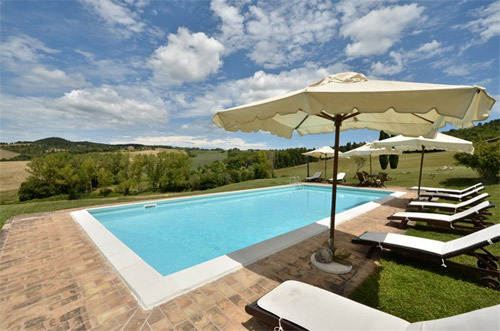 This villa has also a private pool, so during the warmer months guests can cool off with a breathtaking panorama typical of the area. 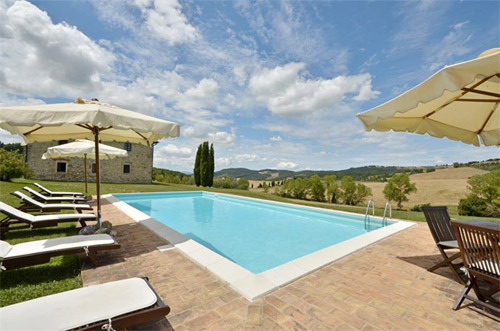 This villa with pool has the good fortune of being in the heart of Tuscany, who will rent will then have the opportunity to visit the many medieval towns in the area. 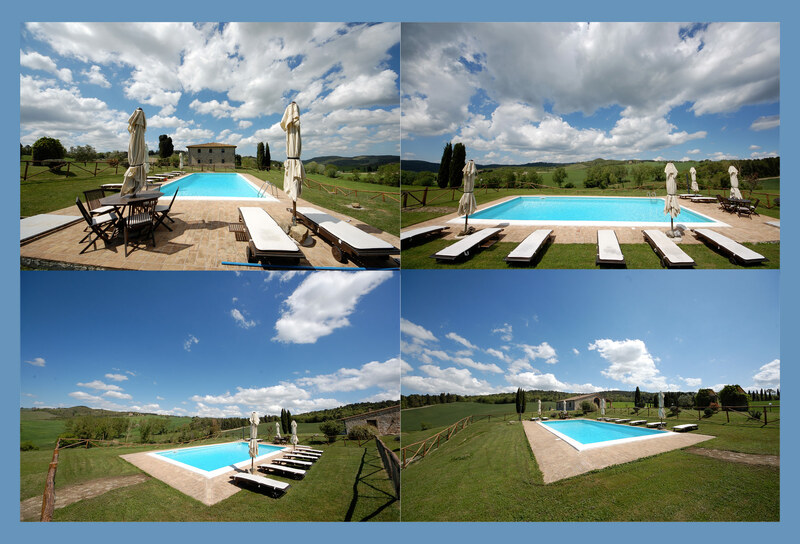 Volterra is only 12 km from the villa, San Gimignano 15 km, the Chianti area can be reached with just over half an hour, Colle Val d’Elsa is located about 15 km. At about 40 km and Siena are less than an hour by car you can reach Florence, or if you prefer you can take the train to Certaldo (beautiful town perched on a hill) the train will take you directly to the center of Florence, the station of Santa Maria Novella . 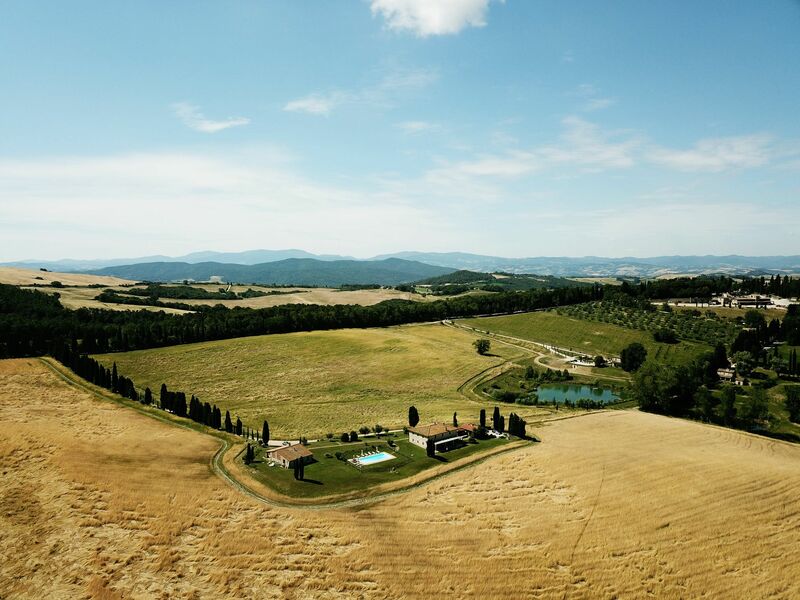 For those who are interested in discovering the nature of Tuscany recommend a refreshing swim in lakes Montenero, or the “Masso delle fanciulle – rock of the girls” on the river Cecina, or a nice walk to the ruins of Castelvecchio. If you like horse riding, you can go on horseback, because only 500 meters from the villa there is a riding school. Anyone who loves mountain biking will find numerous trails and if you are trained you can follow the route of the villas and churches with departure from our villa with swimming pool. Among the other activities that are offered to guests, please note the yoga classes, cooking classes. We can propose also massages, rental of quad tours or hot air ballooning. 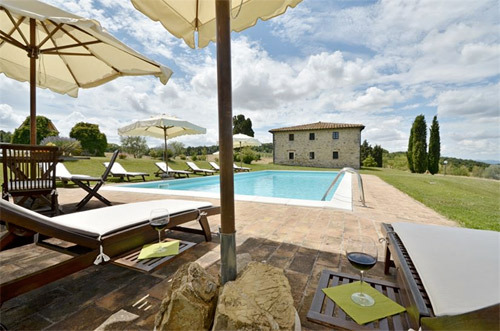 If you have decided to rent this villa in Tuscany with private pool, also for trying the tastes of the area, we will be happy to welcome you to our inn to delight you with typical Tuscan cuisine, or we can arrange guided tours with bus to visit the cellars of the Chianti and taste the different wines. If you prefer to be alone we can tell you the best wineries and book you a tour of the farm of your choice. Renting this villa directly from the owner, you can be sure of getting the best price on the market. In the past years our villa has received numerous reviews on various tourist websites including Tripadvisor, our goal is to always improve in order to offer our guests an ever-increasing degree. 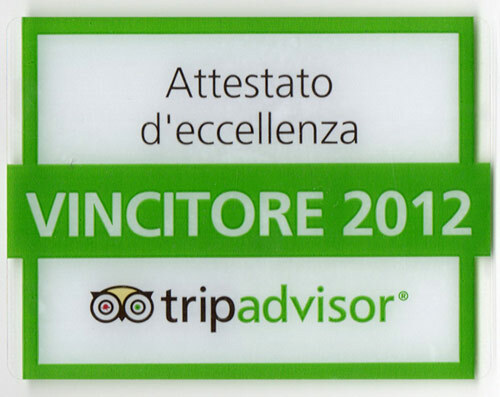 Since 2008 we have received 58 reviews, Thanks very much all of our guests who have stayed with us and gave us such great satisfaction. 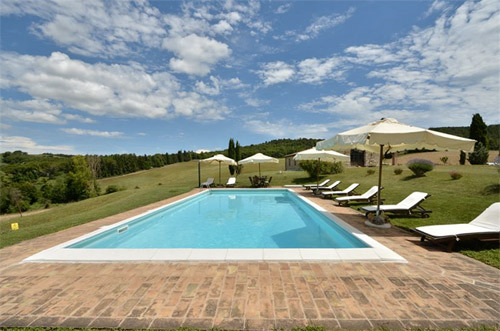 This villa in Tuscany is located in Volterra and is a holiday home that can accommodate up to 12 people, has a beautiful swimming pool and a large garden. The villa is immersed in a natural reserve where it is not difficult to spot deer, wild boar, foxes, hawks and many other wildlife species.